Keysight Technologies, Inc. (NYSE: KEYS) today introduced swept source optical coherence tomography (SS-OCT) application options running at 1 GS/s (-SS2) and 500 MS/s (-SS1). The new options, now available on the U5303A high-speed data acquisition PCIe card, enable OEMs to obtain faster image acquisition by increasing sampling rate and A-scan rate. This allows for non-invasive, high-speed medical imaging in various applications, including ophthalmology, dermatology, gastrointestinal endoscopy, intravascular imaging, oncology and angiography. Information about product configuration is available at www.keysight.com/find/U5303A. High-resolution images are available at www.keysight.com/find/SS-OCT_PCIe_Digitizer_images. 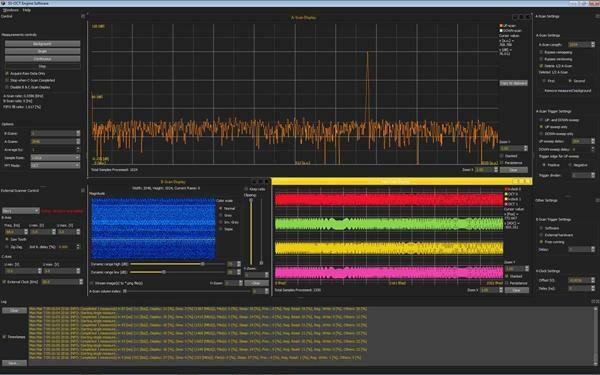 Screenshot of Keysight dedicated SS-OCT GUI development tool illustrating a low noise floor OCT signal, with FFT in the top window, B-scan image, bottom left, and the raw signal data, bottom right. The applications options dedicated to swept source optical coherence tomography (-SS2/-SS1) are available now on the U5303A 12-bit PCIe high-speed digitizers. Please contact digitizers@keysight.com for more information. Keysight high-speed digitizers are the result of more than 300 years of cumulative research and development experience in analog-to-digital conversion technology. This ensures the ability to achieve the most effective and reliable analog-to-digital conversion at high-resolution and fast sampling rates. Information on the technology and its applications is available at www.keysight.com/find/high-speed-digitizers. Keysight provides unrivaled PXI and AXIe performance built on the industry’s most accurate measurement science. Keysight helps engineers get to first measurement faster with common measurement software and Keysight Reference Solutions. Keysight has the industry’s largest global network of experienced application engineers and metrology-grade calibration centers. Additional information about Keysight's PXI and AXIe modular test and measurement solutions is available at www.keysight.com/find/modular. Keysight Technologies (NYSE: KEYS) is a global electronic measurement technology and market leader helping to transform its customers’ measurement experience through innovations in wireless, modular, and software solutions. Keysight’s electronic measurement instruments, systems, software and services are used in the design, development, manufacture, installation, deployment and operation of electronic equipment. The business had revenues of $2.9 billion in fiscal year 2015. Information about Keysight is available at www.keysight.com.